Involuntary Smiles: My Kingdom for a Shower! My Kingdom for a Shower! When I was a kid, I completely romanticized motherhood. But what little girl doesn't? I mean, no one pretends that their baby doll has just had a serious diaper blow out, or that they are covered in spit up, or that somehow, the baby managed to pee into their mouth (yep, that happened to me a few weeks ago during diaper change). No little girl pretends that she hasn't had a shower in about a week, feels slightly haggard, and desperately longs for a quiet moment to herself. It just doesn't happen. 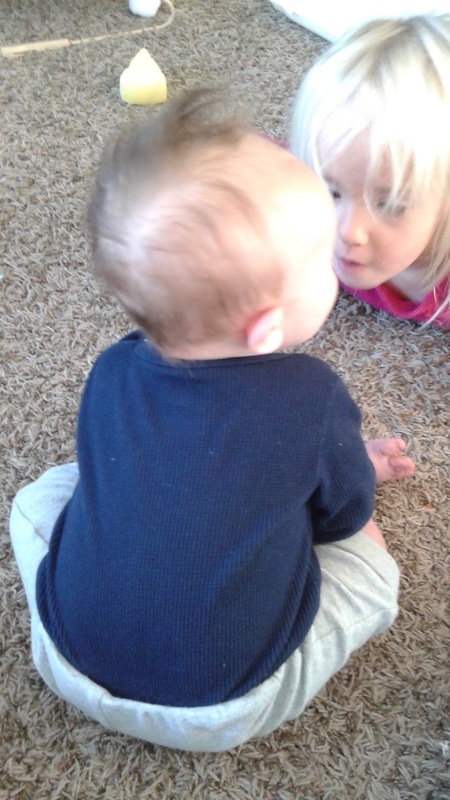 When playing dolls, little girls pretend to feed the baby, rock the baby, sing to the baby, and sometimes play catch with the baby, or use said baby as a weapon when an older brother comes along and is bothering them. As it should be. Because those moments dwarf the less convenient times of being a mother. I completely love babies. They are just precious, and funny, and sweet, and a big ball full of cuddles, and I am so thankful that I get to play with two of them every single day, despite the minor hiccups. Not only do I get to watch Brynlee and Taelynn every day, but I get to play with their 4 month old little brother, Jack. He is such a good baby! He lays in the bouncer, doing little baby crunches, trying to sit up, but not quite ready to. 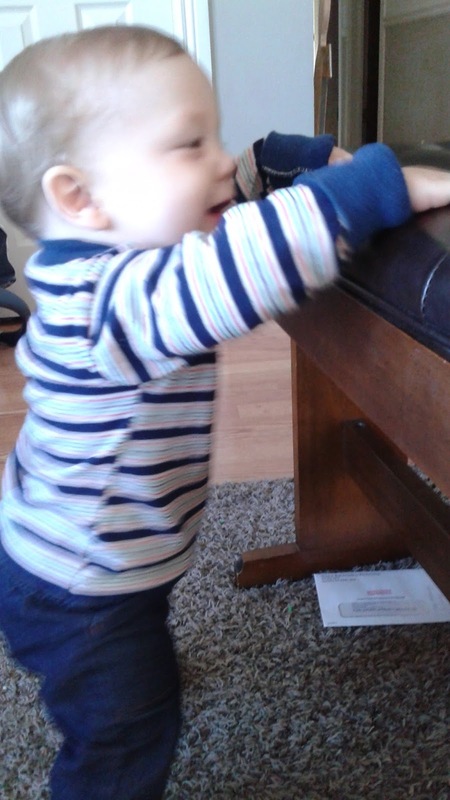 I did sit him up on the floor yesterday and took a picture to send to his mom. That little dude is impatient to keep up with his sisters and will be mobile before long! But he is so good! He lays in that bouncer, and he just grins. He smiles, and he grins, and he does that all day long! And he has the sweetest little crooked smile that will just melt your heart to see. Vince adores Jack. He gets so excited when Jack comes over, and rushes over to see him in the car seat. Of course, he wants to mush Jack's face, so there is constant vigilance when Vince is roaming the room and Jack is on the floor. Vince seems to have a Jack radar and always finds his way over to be by him. And I adore it. Every single moment of it. I find myself constantly thinking that I must be the luckiest woman alive, to have such sweet little babies to fill my days. Today was one of the days that little girls don't romanticize, though. It wasn't a bad day, please don't misunderstand. It was a lovely day, it just didn't go how I had planned. I had one goal for today, and I had been trying the whole day to reach that goal, but things kept coming up. If nothing else happened today, I was going to get a shower. At some point in time. I can't decide if it is funny or sad that I actually have to schedule in a shower into my schedule, but there you have it. When I went to bed last night I sat down and looked at my planner. I made note of the things I had going on. Babysit, check. visit my friend who just had a baby, check. Bake bread, check. It seemed like today was going to be a fairly simple day. There was just one thing that I really wanted to do all day. I didn't care if nothing else got done, I was going to feel clean! Vince didn't have a great night last night. I really have to be more careful about what table food I give him. I feel like it might by hurting his stomach. Potatoes apparently don't agree with him much. Or it could possibly be the butter that I used in the mashed potatoes and forgot about until 3 in the morning when he was sobbing in my arms for no apparent reason. In 45 minute increments for the rest of the night. He finally fell into a good sleep around 5:45. I collapsed onto my bed exhausted, and woke up when Beth came into my room at 7:20 this morning. I groaned and asked her to go and wake Keith and Faye. She takes great delight in waking them up, so she scampered out of the room and turned her bedroom light into a strobe, trying to get Faye out of bed. Keith came up on his own. I hurried home to babysit, but found out that that had been postponed. "Perfect!" I thought, "I can get Vince down for his morning nap, and then jump in and have a quick shower before the kids get here." Except Vince wanted to play instead of sleep. And so I paced the house, sang every lullaby in my repetoire, and played with him for a bit on the floor. He wasn't going to have it. But then finally, he did fall asleep! 5 minutes before the kids showed up. Jack usually sleeps for 3 hours in the morning and at least 1 in the afternoon. But he hadn't had his nap yet, so I was excited. Maybe I could get him to sleep, and all of the kids could go down for their naps at the same time and I could do it! But Jack had other plans. He just didn't want to sleep. He stayed awake the whole entire time he was at my house. That has never happened before! He is such a good sleeper, normally, I couldn't figure it out! 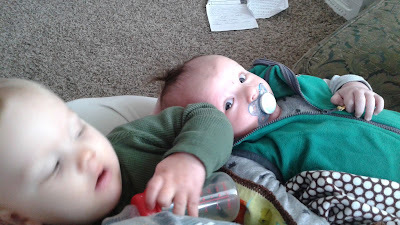 They were both very good and happy, so it wasn't a stressful afternoon at all, I just wish they had slept because I really needed them to. Which is precisely why they didn't. I did impress myself, though. I was able to bottle feed two babies at the same time! Vince has started drinking a little bit of juice and water before bed, and Jack takes formula. Sometimes they need to eat at the same time, and it has been very stressful in those moments. Today, I figured it out. Tandem feedings, and keeping Vince's elbow out of Jack's eye. But then my friend came and picked up her kids. I rocked Vince again, and got him down again. Success! I looked at the clock and saw that I had about 5 minutes before the bigger kids got home. I had to be there to tell them to be quite and to not wake Vince or Beth. They were both napping. And so, I made some snacks, and tried to devise a way to get a moment away, uninterrupted. Hahaha! Because that never happens! Eventually, Jeffrey got home from work, and I still had not reached the one goal I was desperate to get for the day. I mentioned that to Jeffrey, and like always, he came rushing to my aid on his white stallion, his armor so shiny! He scooped up Vince, took over dinner preparations (we had chips and salsa, apparently), and banished me until I felt like I smelled better. He gave me a hug and told me that I smell wonderful, but should go and reach my goal if that would make me feel better. What a catch he is! I reached my goal today. Barely, and it was a lot of hard work, but I feel fantastic now! My hair is super frizzed out because I used baking soda for shampoo today, and vinegar and water for conditioner. It is super frizzed out, but it feel so soft and clean, and that is what I was going for. I can handle a bit of frizz. Tomorrow: Why I cancelled Christmas.